This pattern was a bit of an impulse purchase. When the pattern first came out, I wasn’t fussed by it at all and had no plans at all to buy it. But when I was buying the Hawthorn in the Colette black Friday sale last (er, last last – 2013!) November (no, I havn’t made it yet! ), Zinnia suddenly looked very nice to me! I think I must have seen a couple of nice versions around, and it somehow ended up in my basket. I probably wouldn’t have got around to making it up if it wasn’t for the fact that The Stitchery announced that they were going to run a Zinnia sewalong. I decided that I’d make it up during the sewalong to enter into their sewalong competition. Doesn’t look too bad here – I think my hands are keeping the pouffiness in check! I bought this fabric in Goldhawk road specifically for this pattern. You’ve seen this fabric before in the form of the tie I made my grandad for his birthday. 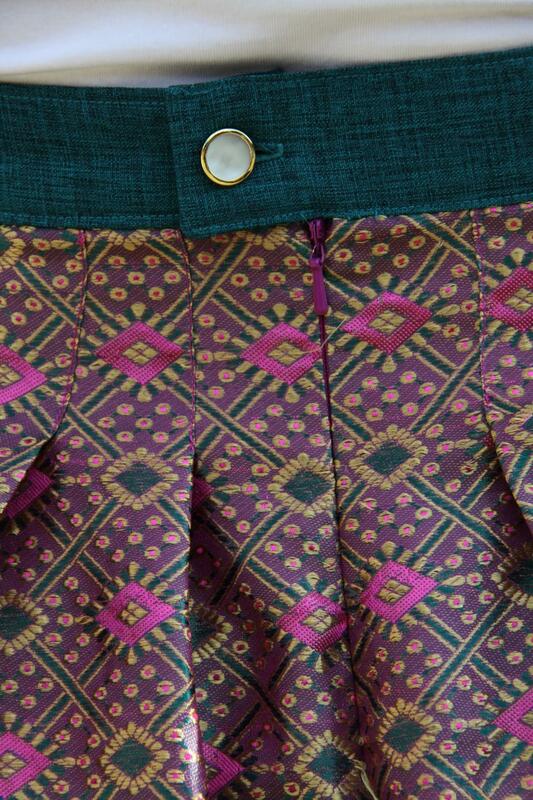 The fabric is a Chinese brocade and, in hindsight, is really not a great fabric for this skirt, but more on that later. I decided to make the pleated version of the skirt. I made this skirt a long time ago, and so don’t remember too many details of the construction, but as far as I can recall, it was fairly smooth. I did try to follow the sewalong, but this was the first sewalong that The Stitchery were running and I don’t think they’d got it down yet. The posts were a little sporadic, and it got to the day before entries were meant to be submitted and there had only been a handful of posts. I did contact them then and ask if they planned to extend it, but didn’t get a reply, so pushed on and got mine done. They did then announce they were extending the sewalong, but the posts were too late for me by that point. The fabric was a bit of a nightmare to work with – it catches on absolutely everything. Every time it moved across the seeminly smooth edge of my cutting table, I could hear it snagging. The fabric also really didn’t work with the pleats of the skirt – it just had way too much body. I’d say the pleats need a drapier fabric to work well, but actually I think it would work well in something like linen, so I’m not sure what character it is they need. But I do know my my fabric doesn’t have it. 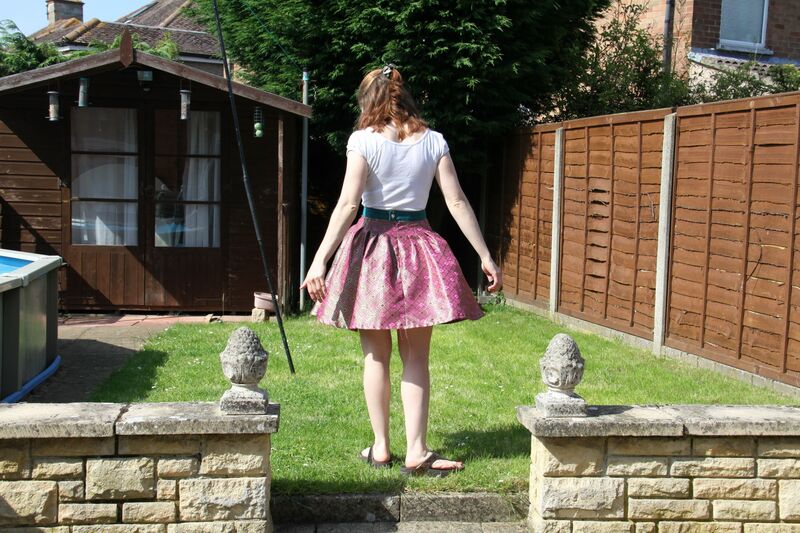 My skirt is just ‘pouffy’ below the pleats. I have tried extending the stitching down the pleats a bit further, pressing them (and then trying to press them out again when that didn’t work), and various other things, but nothing really did the job. The pouffyness is actually worse than it appears in most of these photos as I was trying to get some where it didn’t look quite so bad! Trust me, it’s bad! Super pouffy – I actually look like I’m about to take off here! 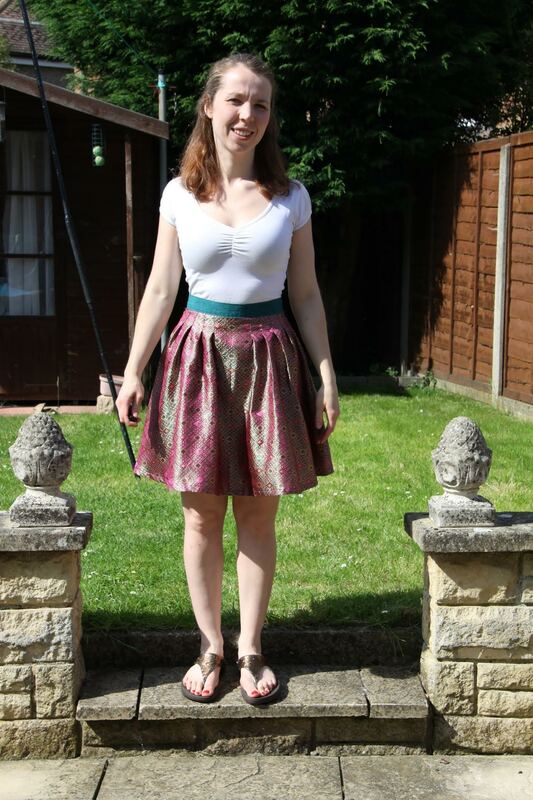 The sad thing is that there are some aspects of this skirt that I really love – I am incredibly proud of the waistband, and the botton closuse – I think that looks really great (although I did somehow manage to make the waistband just a smidgen too small), but I just don’t think the skirt works. Needless to say, it hasn’t been worn, and has just been lying round my sewing room for over a year since I finished it, as I’m not quite sure what to do with it. BUT, although I don’t have a wearable version (and have yet to dream up a version I want to make that I think will work), I don’t regret buying the pattern, or this fabric tao make it from. If I hadn’t bought that fabric for that skirt, I wouldn’t have had it to be able to make my grandad’s tie, and I think this fabric is perfect for that. Clouds, silver linings and all that. I might try and make another Zinnia again in the future, should inspiration strike me. In the meantime, anyone have any thoughts on what I could do to turn this into something wearable?